The Fluke FoodPro Plus dual infrared and RTD thermometer takes noncontact or contact temperature measurement and is used to monitor the temperatures of food products and foodservice equipment. This thermometer measures surface temperature from -35 to +275 degrees C (-31 to +527 degrees F) with an infrared sensor and measures internal temperatures from -40 to +200 degrees C (-40 to +392 degrees F) with a built-in fold-out resistance temperature detector (RTD) probe sensor. It has a 2.5:1 infrared distance-to-spot ratio with LED illumination for highlighting the measurement area. Go/No-Go lights indicate when food is in an unsafe temperature range (40 to 140 degrees F) to meet Hazard Analysis of Critical Control Points (HACCP) guidelines. 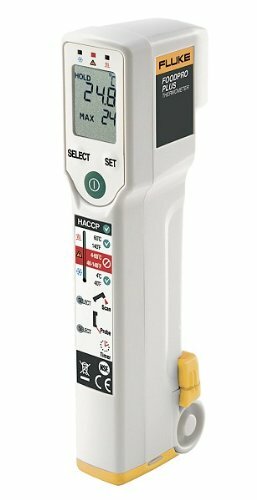 This thermometer is used by foodservice professionals to measure food product and equipment temperatures and help detect potential food safety problems. The Fluke FoodPro Plus shows the maximum temperature for reference. The backlit display helps eliminate light reflections and improves contrast in low-light conditions. It has an integrated countdown timer and alarm to help monitor cooking and cooling intervals and food service line inspections. It is Ingress Protection certified IP54 for dust and splashing liquid and can be hand washed without submersion after use. The European Conformity (CE) marking indicates compliance with applicable European Union (EU) directives. It comes with one 9V battery, a soft case, a calibration certificate with National Institute of Standards and Technology (NIST) traceability and the German Calibration Service (Deutscher Kalibrierdienst, DKD) traceability, and instructions. Digital infrared thermometers measure the temperature of surfaces from a distance. They may measure temperature in Celsius, Fahrenheit, or both. Infrared (IR) thermometers work by focusing the infrared radiation emitted by a surface onto a detector called a thermopile. The thermopile turns the heat into electricity, which is measured and converted to a temperature reading. The reading is then displayed on an LCD display. IR thermometers are used to measure temperature when an object is fragile, as in ear thermometers, or dangerous to be near, as in the case of industrial equipment.